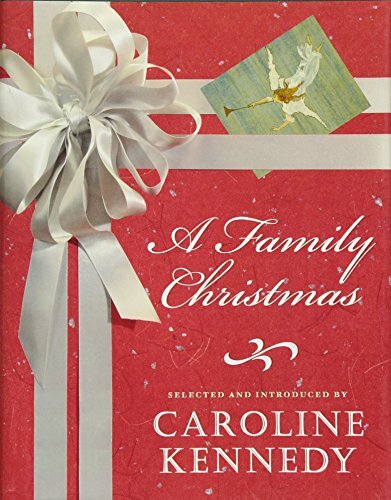 A Family Christmas ***SIGNED*** by Caroline Kennedy: Hyperion, NY 9781401322274 Hard Cover, 1st. Edition, 1st. Printing., Signed by Author on Full Title Page - William Ross, Jr. In A Family Christmas, Caroline shares the Christmas poetry, prose, scriptural readings, and lyrics that are most dear to her, drawing on authors as diverse as Harper Lee, Nikki Giovanni, Martin Luther King Jr., Billy Collins, John and Yoko, and Charles Dickens. There are also many lesser-known gems throughout and personal treasures from her own family--including a young Caroline's Christmas list to Santa Claus and a letter from her father as President to a child concerned about Santa's well-being. This diverse and unique anthology will become a timeless keepsake, and will enrich your heart and mind with the spirit of Christmas. A Family Christmas includes selections from: Groucho Marx, Emma Lazarus, Mark Twain, Sandra Cisneros, Pearl S. Buck, Truman Capote, Gabriela Mistral, Ogden Nash, Clement Clarke Moore, Vladimir Nabokov, Marianne Moore, Calvin Trillin, E. B. White, and many more. Here in A Family Christmas, Caroline Kennedy shares the Christmas poetry, prose, scriptural readings and lyrics that are most dear to her, drawing on auhors as diverse as Nikki Giovanni, David Sedaris, Martin Luther King, Jr., Grace Paley, Billy Collins, and Charles Dickens. There are also many lesser-known gems throughout and personal treasures from her own family—including a young Caroline's Christmas list to Santa Claus and a letter from her father as President to a child concerned about Santa's well-being. This diverse and unique anthology will become a timeless keepsake, and will enrich your heart and mind with the spirit of Christmas.